Pycnonotus latirostris Strickland, 1844, Fernando Po (now Bioko, Equatorial Guinea). 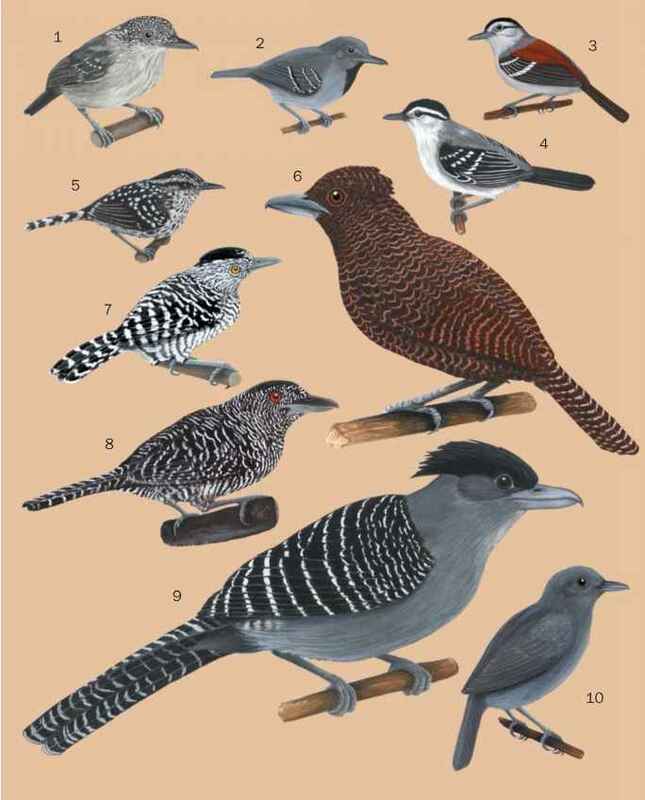 Four races recognized on basis of plumage variation. English: Yellow-whiskered bulbul; French: Bulbul à moustaches jaunes; German: Gelbbartbülbül; Spanish: Bulbul de Bigotes Amarillos. 6.3-7.5 in (16-19 cm); 0.6-1.1 oz (19-32 g). Upperparts and head sooty olive, rump with rufous tinge, back and wings brownish, tail dark reddish brown. Bright yellow moustache stripes on sides of throat. Sexes alike. Juvenile resembles adult, but more dingy brown, no moustache. Endemic; central and West Africa. Solitary and generally unsociable, usually travels singly. Bathes frequently. Sings continuously, dry jumbled notes; "chop, chip, chirrop, chup, prip, prip" repeated, volume increases throughout song, ends with loud "kick kick." Nonmigratory. Omnivorous, eats fruits, berries, many invertebrates including mollusks, woodlice, spiders, frogs, and geckos. Shy when feeding, will fly from undergrowth, gorge on fruits, then return to cover. Often hovers while plucking fruit or gleaning insects from vegetation. Will dig in loose soil for insects. Quite variable. 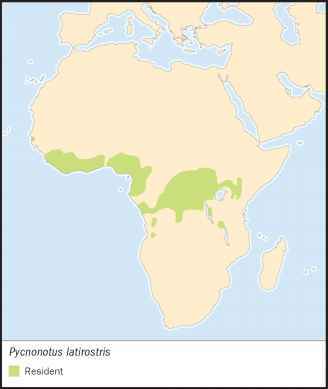 In high-density areas uses leks; polygamous and non-territorial with some evidence of cooperative breeding. Before breeding season, males gather and sing at lek sites. Females gather at leks and choose male, female then takes care of young. At lower densities, monogamous and territorial. One to four eggs, incubation by female only 12-14 days. Outside of leks, both care for young. Not threatened. Common and abundant, often most abundant bird in species in range.